The Struggling Cyster: Is anybody out there? and how many of my sweet readers it affects. I wish I was the only one. I would never in a million years wish for this heartache to be felt by another person. so I commonly take pregnancy tests. At least one a month. Happy tears, sad tears, scared tears. What if I lose this baby too? Can I truly handle miscarrying AGAIN!? What if this baby makes it full term? do moms without any problems or scares ever feel this way? I don't know how those women feel. But I sure hope that most women aren't scared every single day. and I will take one next week. Then I won't for a long while, because Dustin and I are apart for 5 months. even when every ounce of me knows it is a negative. I honestly don't care if my baby has problems, or my baby is not perfect to someone else. It will always be perfect to me. And I want it just the way it is. One day I will have children. but they will be mine. "I honestly don't care if my baby has problems, or my baby is not perfect to someone else. Aww, Megan! I didn't realize you guys were trying to have a baby! As a fellow PCOSer, I understand what you are going through. 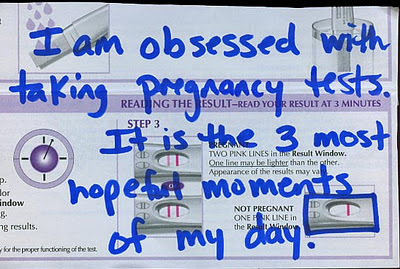 Although we have never "tried" to get pregnant, I was constantly fearful what I thought would be my infertile future. As we both know, some things just happen for a reason and the fact that you CAN get pregnant is a great start. 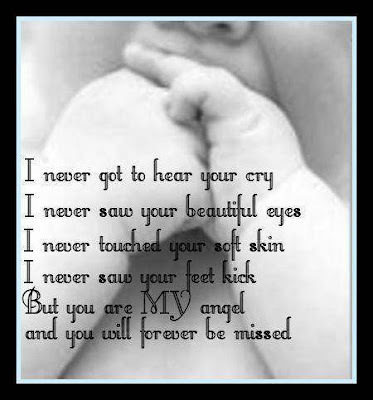 I can't imagine what it must feel like to lose a child although I have been scared almost every day for the last 8 months. We recently had a scare and had to go to the hospital to get looked at. THANK GOD, everything was ok, but it made me realize that the worrying will NEVER end. Worrying about getting pregnant > worrying about passing the first 12 weeks > Worrying about abnormalities > Worrying about feeling baby move > Worrying about how you and baby will be during labour > Worrying about SIDS > Worrying about them every single day of their life, lol..